The PCA&D website has a new look! Last month PCA&D published a newly redesigned website. With the goal of making the website more engaging and easier to navigate, the new site has a fresh look and feel, and is designed to be responsive and improve our ability to share what is happening here at PCA&D, and share the great art made by our students and faculty. Over the last few years, Americans, and especially those of college age or younger, have changed the way we use the internet, spending much more time on our phones. PCA&D’s new website is fully optimized for mobile devices, allowing prospective students, current students and the public to learn about the College, whether you are at home or on the move. You’re the Messenger. Deliver Ideas. Carry Influence. The new website contains sections designed for prospective students to show who we are and how they can join the PCA&D family. Your Canvass Stretches Across A Lifetime. Authentic voices from PCA&D students and faculty can be heard during our new PC&D Video with footage from around the College. Also there's new videos illustrating each of our majors. The new PCA&D website also contains updated access points for student art, gallery shows, events and news, so whether you are an student, alumni, faculty or staff member, or a visitor to the College, you will always be able to find what you need to know. 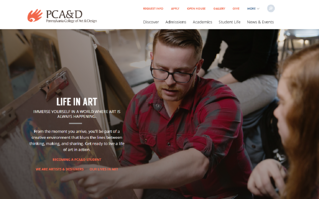 Check out www.pcad.edu and discover new things about PCA&D!